Cyclophilins (Enzyme Commission (EC) number 5.1.2.8) belong to a group of proteins that have peptidyl-prolyl cis-trans isomerase activity; such proteins are collectively known as immunophilins and also include the FK-506-binding proteins and the parvulins. Cyclophilins are found in all cells of all organisms studied, in both prokaryotes and eukaryotes; humans have a total of 16 cyclophilin proteins, Arabidopsis up to 29 and Saccharomyces 8. The first member of the cyclophilins to be identified in mammals, cyclophilin A, is the major cellular target for, and thus mediates the actions of, the immunosuppressive drug cyclosporin A. Cyclophilin A forms a ternary complex with cyclosporin A and the calcium-calmodulin-activated serine/threonine-specific protein phosphatase calcineurin; formation of this complex prevents calcineurin from regulating cytokine gene transcription. Recent studies have implicated a diverse array of additional cellular functions for cyclophilins, including roles as chaperones and in cell signaling. The terms 'cyclophilin' and 'peptidyl-prolyl isomerase' (PPIase) are almost synonymous today, but the identification of the first protein that showed PPIase activity over 20 years ago  was independent of the purification of cyclophilin A (CypA) from bovine thymocytes as an intracellular protein with a high affinity for the immunosuppressive drug cyclosporin A (CsA) . It was not until five years later that the 18 kDa protein with PPIase activity and CypA were found to be one and the same [3, 4]. Along with the discoveries of other PPIase proteins (immunophilins), such as the parvulins and the FK-506-binding proteins (FKBPs, which bind the immunosuppressant drug FK-506), additional cyclophilins have subsequently been identified and the cyclophilins were found to constitute a protein family. All cyclophilins share a common domain of approximately 109 amino acids, the cyclophilin-like domain (CLD), surrounded by domains unique to each member of the family that are associated with subcellular compartmentalization and functional specialization [5, 6]. Cyclophilins have been found in mammals, plants, insects, fungi, and bacteria; they are structurally conserved throughout evolution and all have PPIase activity. There are 7 major cyclophilins in humans - hCypA (also called hCyp-18a, 18 denotes molecular mass of 18 kDa), hCypB (also called hCyp-22/p, 22 kDa), hCypC, hCypD, hCypE, hCyp40 (40 kDa), and hCypNK (first identified from human natural killer cells) - and a total of 16 unique proteins [7, 8]. Drosophila has at least 9 cyclophilins  and the plant Arabidopsis thaliana has 29 putative cyclophilins , whereas 8 cyclophilins, Cpr1-Cpr8, have been found in Saccharomyces cerevisiae (reviewed in ). Little is known about the genomic structure of human cyclophilin genes; they are generally not linked to each other in the genome. What is peptidyl-prolyl isomerization and why does it require a catalyst? The peptide bond has a partial double-bond character, and like all double bonds with similar combinations of side chains, it can exist in two distinct isomeric forms: cis and trans. The lower energy-state trans peptide bonds, whose side chains are 180 degrees opposite each other, are sterically favored, and the ribosome is thought to synthesize peptide bonds in this form. In many proteins containing proline, however, the bonds preceding each proline (peptidyl-prolyl bonds) also occur in the cis form, with the side chains adjacent to each other; both de novo protein folding and the refolding processes following cellular membrane traffic necessitate isomerization to the cis form. 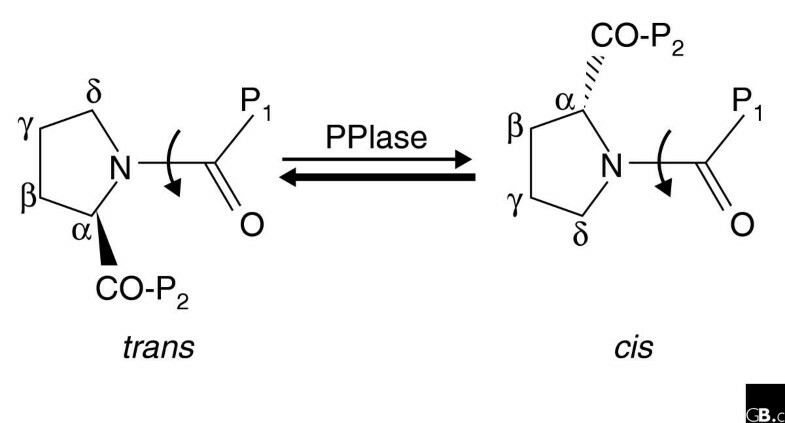 Spontaneous isomerization of peptidyl-prolyl bonds requires free energy and is a slow process, particularly at lower temperatures, and it constitutes a rate-limiting step in folding. Cyclophilins stabilize the cis-trans transition state and accelerate isomerization, a process that is considered important not only in protein folding but also during the assembly of multidomain proteins (Figure 1) . Regardless of their origin, the structural conservation of cyclophilins throughout evolution and the PPIase activity of all members underlines the importance of this enzymatic reaction. A schematic illustration of the trans and cis isomers of the peptide bond between proline (on the left of each structure shown) and another amino acid (P1, on the right). The interconversion between the two forms is catalyzed by cyclophilins and other peptidyl-prolyl isomerases (PPIases) . The carbon atoms of the proline are indicated by Greek letters; P2 indicates a third amino acid on the other side of the proline. The peptide bond has some double-bond character and is planar. Cyclophilins also have varying degrees of affinity for the immunosuppressive drug CsA, a cyclic 11-amino-acid peptide produced by the fungus Tolypocladium inflatum. CypA, in particular, is the major intracellular receptor for CsA . In mammals, the CsA-CypA complex binds to and inhibits calcineurin, a calcium-calmodulin-activated serine/threonine-specific protein phosphatase. The inhibition of calcineurin blocks the translocation of nuclear factor of activated T cells (NF-AT) from the cytosol to the nucleus, thus preventing the transcription of genes encoding cytokines such as interleukin-2 [11, 12]. In the yeast S. cerevisiae, inhibition of the calcineurin homolog by the complex between CsA and the cyclophilin A homolog Cpr1 prevents recovery from pheromone-induced growth arrest . In the human-pathogenic fungus Cryptococcus neoformans, inhibition of the calcineurin homolog Cna1 by a complex of CsA with either of the cyclophilin A homologs Cpal or Cpa2 prevents growth at elevated temperatures [14, 15]. The 18-kDa archetypal cyclophilin CypA is cytosolic and found in all tissues in mammals, whereas other cyclophilins, whether they have a CLD alone or in combination with other domains, are found in the endoplasmic reticulum (ER), the mitochondria, or the nucleus. The crystal structures of several cyclophilins have been determined (reviewed in ). Human CypA has an eight-stranded antiparallel β-barrel structure, with two α helices enclosing the barrel from either side (Figure 2). Seven aromatic and other hydrophobic residues form a compact hydrophobic core within the barrel, usually in the area where CsA binds. A loop from Lys118 to His126 and four β strands (β3-β6) make up the binding site for CsA [17, 18]. The overall structure of hCypB resembles that of hCypA, the main difference being in the two loop regions (residues 19-24 and 152-164) and at the amino and carboxyl termini . Murine CypC also has a structure similar to that of hCypA, differing mainly in the conformation of three surface loop regions . The large cyclophilin Cyp40 consists of a CLD with a structure similar to that of hCypA linked to tetratricopeptide repeats (TPRs), which are also found in proteins involved in stress responses. Structural analysis reveals that the TPR domain of Cyp40 consists of seven helices of variable lengths incorporating three TPR motifs. Cyp40 crystals come in two shapes: in the monoclinic form, the carboxy-terminal residues protrude beyond the body of the TPR domain to form a charged helix, whereas in the tetragonal form two of the TPR helices are straightened to form one extended helix . The structure of the ternary complex between the drug cyclosporin A (CsA), human cyclophilin A (CypA) and human calcineurin . The CsA-CypA binary complex lies at the base of the helical arm of the catalytic subunit of calcineurin (CnA) that binds the regulatory subunit calcineurin (CnB); it nestles in a hydrophobic groove in intimate contact with both subunits, at a region unique to calcineurin and not found in other phosphatases, and this intimate contact gives the interaction high specificity. Reproduced with permission from . Cyclophilins can be found in most cellular compartments of most tissues and encode unique functions. In mammals, CypA and Cyp40 are cytosolic whereas CypB and CypC have amino-terminal signal sequences that target them to the ER protein secretory pathway (reviewed in [7, 16]). CypD has a signal sequence that directs it to the mitochondria [22, 23]; CypE has an amino-terminal RNA-binding domain and is localized in the nucleus  and Cyp40 has TPRs and is located in the cytosol . Human CypNK is the largest cyclophilin, with a large, hydrophilic and positively charged carboxyl terminus, and is located in the cytosol [26, 27]. The yeast cyclophilin Cpr1 is a homolog of hCypA that shares 65% identity in amino-acid sequence and is present in the cytoplasm and also enriched in nuclei [28, 29]. Cpr2, Cpr3, and Cpr5 have amino-terminal signal peptides directing them to the ER (Cpr2 and Cpr5 [30, 31]) or the mitochondria (Cpr3 [32, 33]; Figure 3). Cpr4 and Cpr8 contain a single CLD domain plus a long amino-terminal signal peptide and are located in vacuoles . Lastly, Cpr6 and Cpr7 are homologs of the human Cyp40 protein and have long carboxy-terminal TPR repeats; they associate functionally with homologs of heat-shock proteins and other protein chaperones . The primary structures and localizations of the yeast cyclophilins, as well as their mammalian orthologs, are summarized in Figure 3. 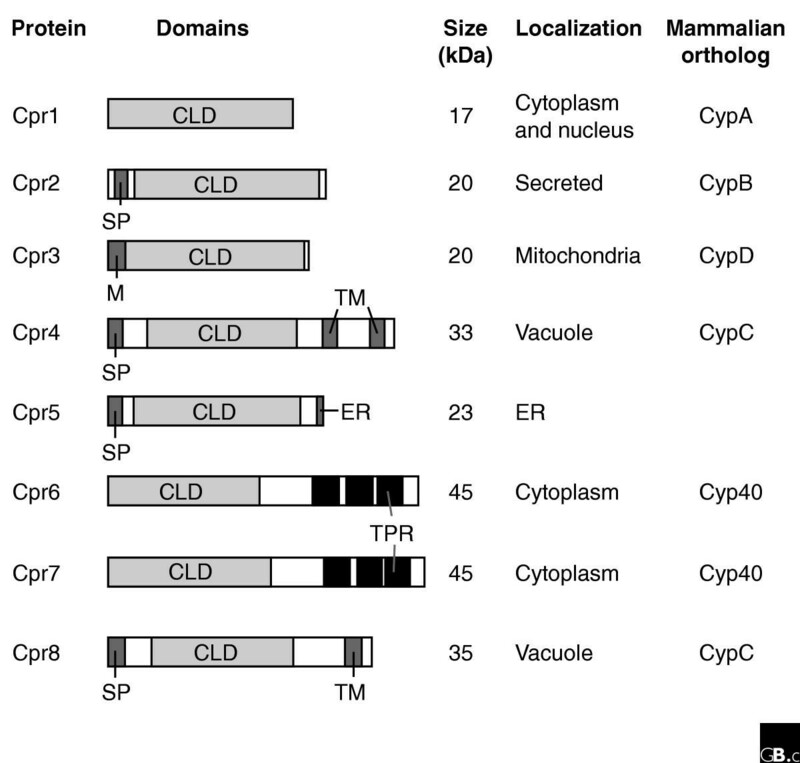 Primary structures, localizations and mammalian orthologs of S. cerevisiae cyclophilins . Abbreviations: CLD, cyclophilin-like domain; ER, ER retention signal; M, mitochondrial localization signal; SP, signal peptide; TM, transmembrane domain; TPR, tetratricopeptide repeat. The immunosuppressive action of CsA is exerted via a ternary complex between CsA, CypA and calcineurin. The crystal structure of the complex has recently been determined to a resolution of 2.8 Å (Figure 2) [36, 37]. Binding of the CsA-CypA complex to calcineurin increases the complex's stability, and the complexed proteins remain resistant to proteolytic cleavage . Upon binding of CsA to CypA, the charges and hydrophobic surfaces of the drug-protein complex become more congruent with the binding site on calcineurin. The CsA-CypA complex binds at the interface between the catalytic and regulatory subunits of calcineurin (Figure 2). Most importantly, CsA-CypA binding to calcineurin inhibits the phosphatase activity and biological function of calcineurin [11, 13, 39, 40]. Several protein-folding processes depend on the catalytic and/or chaperone-like activities of cyclophilins. For example, CypA promotes both the formation and the infectivity of virions of the human immunodeficiency virus (HIV)-1 [41–47]. CypA is incorporated into HIV-1 virions, where it interacts with HIV-1 Gag, the polyprotein precursor of virion structural proteins. A small region of the HIV-1 capsid protein containing four conserved prolines has been shown to be important for incorporation of CypA into virions [48, 49]. A retina-specific cyclophilin of the fruit fly Drosophila melanogaster, NinaA (an ortholog of mammal CypC), is crucial for the folding of rhodopsin isoforms [50, 51]. A mutation in the gene encoding NinaA results in improper folding of rhodopsin and subsequent abnormal expression of the protein . CypA is also important in the folding of neu-ronal receptors. 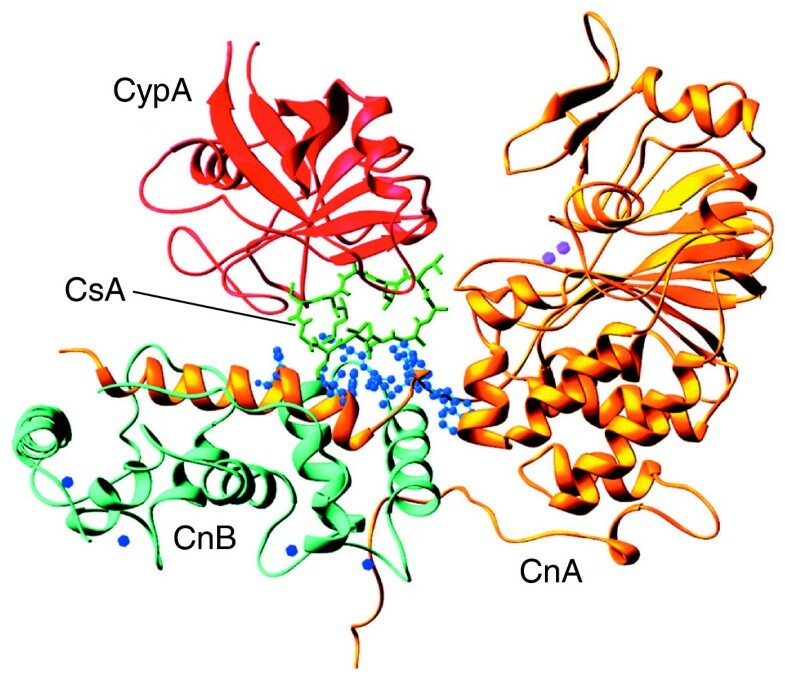 Using CsA to probe the expression of homo-oligomeric receptors containing nicotinic acetylcholine receptor subunit α7, Helekar and colleagues  concluded that CypA might have a critical role in the maturation of homo-oligomeric receptors by acting directly or indirectly as a prolyl isomerase or as a molecular chaperone. Cyclophilins can also act as modulators of protein function. The mammalian cyclophilin Cyp40 is part of the steroid-receptor complex and can form a dimeric complex with the heat-shock protein Hsp90, a process not affected by CsA [53, 54]. In yeast, the Cyp40 homologs Cpr6 and Cpr7 also associate with Hsp90 homologs and have analogous functions . A mammalian Cyp40 has been shown to regulate the activity of the transcription factor c-Myb , whereas CypA has been associated with YY1, a zinc-finger suppressor of gene transcription , and Zpr1, an essential zinc-finger protein . In addition, the ER-specific cyclophilin CypB can form a complex with the peptide hormone prolactin to induce transcription of a range of genes . Contrary to the expectation that the highly conserved cyclophilins might be essential for protein folding, none of the eight individual cyclophilins was found to be essential in S. cerevisiae . In fact, we showed that an octuplet mutant lacking all eight cyclophilins was viable and that there was little or no evidence for functional redundancy . Recent studies also reveal that Cpr1 has a role in modulating the activity of two different histone-deacetylase complexes (Sin3-Rpd3 and Set3C) and is important in enabling the transcriptional events necessary during the switch from mitotic to meiotic cell division in budding yeast [29, 60, 61]. This is in accord with our recent finding that Cpr1 is enriched in the nucleus in yeast cells, and it reveals a clear selective pressure for maintaining this highly conserved enzyme . The pathogenic yeast C. neoformans has two similar CypA-related proteins, Cpa1 and Cpa2. In contrast to the viable octuplet cyclophilin mutant strain of S. cerevisiae, Cpa1 is required for growth of C. neoformans at elevated temperatures and for full expression of fungal virulence, whereas Cpa2 is dispensable for these functions in the presence of Cpa1. Deletion of both the CPA1 and CPA2 genes leads to a conditional synthetic phenotype, resulting in a defect in growth and virulence . In our current models, this role of Cpa1 and Cpa2 is hypothesized to be independent of calcineurin function, suggesting a novel role for cyclophilin A homologs in the growth and virulence of this pathogen . Recent studies have suggested a new role for cyclophilins in cell signaling. For example, mammalian CypA has been found to regulate the T-cell-specific interleukin-2 tyrosine kinase Itk, which contains conserved Src homology 2 (SH2), Src homology 3 (SH3), and kinase domains [63–65]. Itk is a non-receptor protein-tyrosine kinase that has a role in the maturation of thymocytes and is required for intracellular signaling events leading to T-cell activation. Binding of CypA to the SH2 domain of Itk results in conformational change within the SH2 domain that alters ligand specificity . Mutation of a proline residue in the SH2 domain disrupts the interaction between Itk and CypA and specifically increases the production of type 2 (Th2) cytokines (cytokines produced by Th2 helper cells) [65, 66]. In another example of a cyclophilin involved in cell signaling, human CypB has been found to govern the activation of interferon-regulatory factor-3 (IRF-3). IRF-3 is a member of the group of interferon regulatory factors that induce interferon-β once translocated into the nucleus. CypB interacts with IRF-3 in the yeast two-hybrid assay. An RNA-interference study of CypB indicates that the suppression of virus-induced IRF-3 phosphorylation and other related events can result in the inhibition of interferon-1β . Finally, the mitochondrially targeted cyclophilin CypD has been found to play an important role in the mitochondrial permeability transition, in which mitochondrial pores open, leading to cell death [68–72]. By generating CypD-deficient mice, several research groups have discovered that CypD and the mitochondrial permeability transition are required to mediate the cell death induced by calcium and oxidative damage, but not to mediate conventional apoptosis involving Bcl-2 family proteins [70–72]. Further exploration of the role of CypD in mitochondrial function and its potential as a novel drug target has been also discussed recently . We thank Hengming Ke for providing Figure 2 and J.A. King for careful reading of the manuscript. Research in the Wang and Heitman laboratories is supported by NIH grants A1054958 (P.W. ), A103911I5, A1042159, A1050113, and A1050438 (J.H.). J.H. is a Burroughs-Wellcome Scholar in Molecular Pathogenic Mycology and an investigator of the Howard Hughes Medical Institute.